It's that time of year again. All the wonderful sets and limited edition palettes are coming out just in time for the holidays. A new blush palette from NARS, how can you say no? I am certain this will be even more popular than the Danmari palette of 2011. This year’s blush palette comes with four blushes (three of which are brand new shades), a highlighter and a classic bronzer. I love the shades chosen for this palette. However, if you’re a NARS lover, chances are you will already own the existing shades, in which case you’re just paying for the three new ones. It’s a great palette for the NARS beginner (or the makeup collector). This palette is not available just yet, but you can expect it to pop into Sephora stores around November 1st. I believe it’s a Sephora exclusive. Btw, if you're wondering... a full-size blush contains 4.8g, while a full-size bronzer is 8g. I love this adorable set of mini Bite High Pigment Pencils. Last year, I picked up a tin of mini Bite lipsticks & fell in love with the brand. Their lipsticks are hydrating, pigmented, and edible (though I wouldn't recommend actually eating them -- you wouldn't want to waste them). This tin of retractable jumbo pencils is the perfect purse companion. No sharpening and you get four great shades to take you from day to night (or work to party). Plus, the pricing in on point. One full-size pencil is 0.09 oz for $28, but you can get four almost full-size shades for the same price. What can I say? I have a weakness for blush palettes. This limited edition blush set from Tarte contains four Amazonian 12-hr blushes and the cult favourite Amazonian clay bronzer. The sizes are pretty generous, too. Not quite full-size, but pretty close. It’s a good deal considering a single full-size blush is 0.20 oz & $31 CDN. You can get four almost full-size blushes and a half full-size bronzer for $50. What’s more, it also comes with a wearable bow bracelet. How cute! 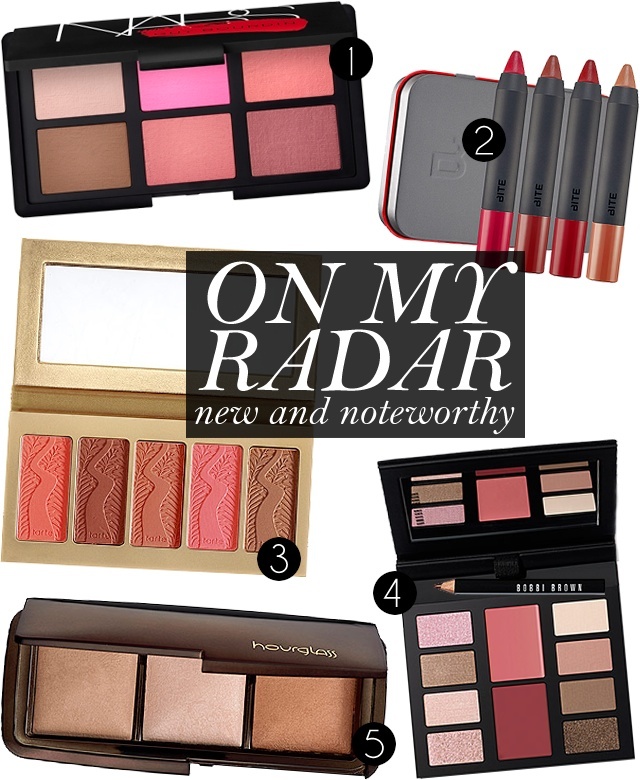 Who doesn’t love all-in-one palettes? They’re easy to use and great for traveling. Enter the latest collaboration between Bobbi Brown and Katie Holmes (who has been the face of the brand for the last year now). It’s a gorgeous palette that consists of eight eyeshadows, a mini eye pencil, and two Pot Rouge shades to help you create a multitude of different looks. Want a palette for your eyes, lips, and cheeks? This palette has you covered. I have had my eye out for this limited-edition palette since I saw it appear on Instagram a couple months ago. I adore the Ambient Lighting Powders, so naturally I fell in love when I saw this trifecta. It comes with three shades. Two are permanent and one is limited-edition. Each shade offers a different effect, but they’re great for adding that “lit from within” glow. One disappointing thing about his palette is the price in relation to the size of each powder. All three powders are the same size as one full-size compact. So, if you do the math, you’re paying an additional $15. I suppose you could consider it a tariff for the convenience of having a three-in-one palette, for having a limited-edition shade, and for the deluxe mini sample of Veil Mineral Primer. Regardless, the palette is gorgeous and it consists of some of my favourite finishing powders. I am NOT missing out a NARS palette this year!